ISLAND life. That’s what the Loop Head peninsula has been like, on and off, since this ferocious year began less than six weeks ago. Island life, but without the grants, or the social welfare bonus, or the NCT exemption. Loop Head is a pretty peninsula, svelte enough to show off the sea on all three sides at once. It’s green and pastoral and quiet, but it feels at times like the wildest place on earth. Two scrawny roads lead to it, and both of them have been obliterated by the sea twice so far this year, cutting us off from the rest of Ireland. At the beginning, it’s like the first few hours of a power cut – all pre-industrial novelty. “When was the last time we played Cluedo by candlelight?,” you say cheerfully, as if forgetting that actually you’ve never experienced the slightest temptation to play Cluedo at all. In the first 24 hours after being marooned, people get a quick kick out of disrupted routine – lighting big fires, running around to friends’ houses with baked goods, catching up on their correspondence, laughingly declaring a republic. Community spirit – always strongest in remote, weather-beaten places like this – makes everyone feel better. The locals gather rubbish, clear stones, sweep up kelp, check on their neighbours. In the following few days, disaster tourists begin arriving in their cars to stare into the sinkholes that divide us from them, and to commit the scene to their cameraphone’s memory, if not their own. Hyperbole is thrown about like flotsam – “disaster”, “tragedy”, “devastated” – though nobody died. Yellow county council machines move things around inscrutably. Still no road. Gradually the worry grows from a niggle to a panic. How long are we going to be left like this? Even in view of the wreckage, twice over, of local infrastructure since the start of this year, probably the worst thing to happen to west Clare was the flooding of Cork this week. Once a city has fallen, that’s it for the rest of us. Cork is at once deluged with promises of hundreds of millions of euros, and the people of west Clare fear being left tiptoeing through the seaweed in perpetuity. 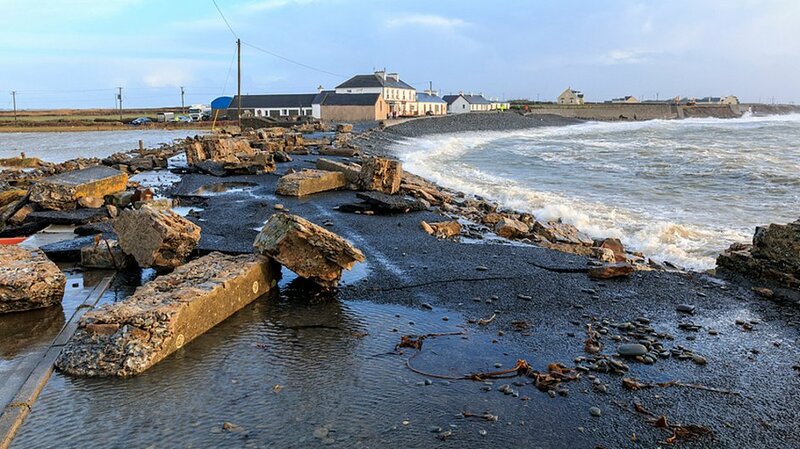 In its report to government last month, Clare County Council estimated that the January storms did €23.7m worth of damage along the Clare coast – almost €3.5m of that here in Kilbaha village alone. Then last weekend happened. Meanwhile, environment minister Phil Hogan has allocated €15m for flood relief nationally. The R487 (as absolutely nobody calls it) veers too close the sea on the south coast of Loop Head at Kilbaha, and was turned into rubble by Storm Christine in January. The county council spent hundreds of man-hours crudely patching it up so the stranded inhabitants of the western end of the peninsula could get back to their normal lives. And we did, briefly. But in the storm and high tides of last weekend, the sea simply reclaimed the road in full. The only signs of human endeavour left on Sunday were the remains of the council’s temporary concrete barriers, tortured and broken to bits as they tried to hold back the waves. Similarly, along the north coast of the peninsula, the thoroughfare was made impassable by beach stones and gabions – the rock-filled cages that are supposed to keep the sea away from the road and are now instead strewn all over it. No one is asking how much money and time have been spent already on the Sisyphean task of repairing all this damage. No one really wants to know, because it has all come to nothing. What people do want to know is how much more money we can honestly expect will continue to be thrown at this problem in the vain hope of making it go away. It’s worse elsewhere, of course, which isn’t helping. In Kilbaha, there are two public businesses (our only two) close to the water line, but very few houses, most villagers having settled on higher ground at least 200 years ago. But east of here, an estimated 1,200 acres of land are under water, and there is worse to come. Meanwhile, Limerick city, submerged and angry, is deeply and vociferously regretting the property tax. Then there’s Cork, still at a loss over whether to blame this government, the last government, or St Finbarr. Clonmel, meanwhile, is dry – at least for the present. The town that suffered the worst flooding in recent years is now the proud owner of a €40m flood defence scheme, completed in 2012. By happy coincidence, Clonmel happened to be in the constituency of the then minister with responsibility for the OPW, Martin Mansergh. He has professed himself very proud of the flood defence system, and understandably so. Local paper the Nationalist reported this week that only one town centre home was damaged by rising water. The government had been working on plans to spend €45m nationally on flood defences, but is now considering increasing that sum to €100m over the next five years. Bear in mind that a capital investment of €100m would just about cover the long-talked-about flood defence system for Cork city. “By comparison with other European countries, we are not as well prepared,” said Brian Hayes, junior finance minister with responsibility for the OPW, when asked about flood defences this week. Hayes is at pains, though, to make us understand that there isn’t enough money to do everything. “The idea that we can protect every acre of land in the country is a lie and a pretence and that has to be struck on its head,” he told RTE Radio 1’s Today with Sean O’Rourke this week. So we can’t all be saved. We probably all knew that already. What we don’t know is who gets the right to decide who is saved and who isn’t. Choices are going to be made, but who is going to make them, and on what basis? Who has the strongest claim on those rapidly dwindling funds? Meanwhile, back here on the Atlantic seaboard, communities are bracing themselves yet again as another angry mob of low-pressure systems makes its way eastward to beat us up next week. And in many of those communities, people are quietly starting to wonder if maybe things would be better for us if they were worse. EVEN now, after all these days without electricity, can there be anyone out there who has at last memorised their MPRN number? You don’t say that, of course. No one is mad at ESB because there’s been no power since Wednesday. Everyone knows they’re doing all they can. Honestly, you’d sooner sit in the dark for a week than demand that men be sent up poles in a hurricane. Still, though, it’s a niggle, the MPRN business; it’s something of a match in the powder barrel. At any rate, ESB makes it clear almost immediately that it’s not interested in taking calls from people wanting to shoot the breeze about corporate identification – or even about when the power might come back. The recorded message on the ESB’s fault and emergency line says as much: “Are you actually in the throes of a heart attack, your legs trapped under a fallen electricity pole that’s also on fire? No? Thought not. Please hang up then,” or words to that effect. Things get so old school in a power cut. If you’re lucky enough to have an open fire or a range, you’ve got one warm room in the whole house – just like the old days! Boiling Golden Wonders on an elderly Rayburn, you begin to wonder if there mightn’t be space on the walls for a picture of John F Kennedy and a Sacred Heart. You play Cribbage by candlelight. Yes, Cribbage. Cluedo, it has emerged, is not an ideal game for two players: “I didn’t do it, so it must have been you”. And Monopoly is well known for causing even more damage to a relationship than three days spent alone together in post-apocalyptic conditions. 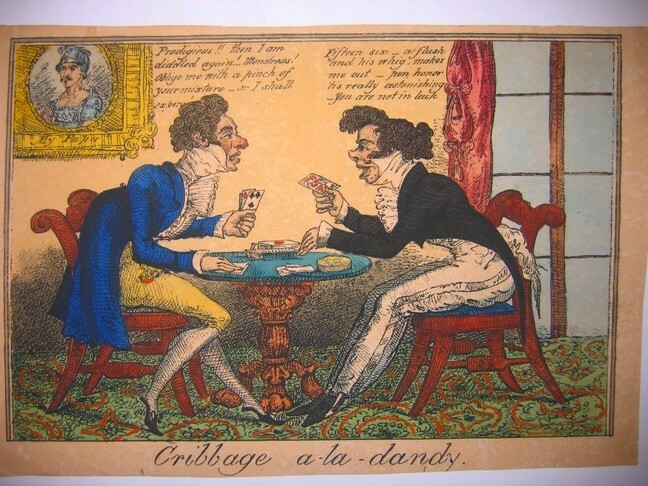 Cribbage keeps things nice and courtly. You forgot the advice – such good advice – always to charge your mobile phone before a power cut, but after three days (or more like three hours) everyone’s iPhone has died anyway. Mobile communications begin to seem like something we flirted with briefly – something we can now question the wisdom of, in hindsight. The landline, improbably enough, stays working throughout the whole misadventure, which is lucky. Things are bad enough without having to deal with Eircom, and anyway they have something in their customer charter about not conducting repairs when there’s an R in the month. There’s no light, no heat and ultimately – when the last drop from the inoperative pumping stations reaches you – no water. More importantly, there’s no radio, no television, and no internet. That means no access to the news. I repeat, three days without news. In the darkest hour of this, when you hit rock bottom, you have to admit you’re helpless, conduct a searching and fearless moral inventory, and turn yourself over to a higher power. There are nine other steps too which you must look up on the internet when the electricity comes back. Two important notes to self after half a week of powerlessness: one, find out if they’re still making wind-up radios; two: write the MPRN number on the wall beside the phone.